Middle blocker Scott Cross, a Truckee native, was named the tournament MVP. 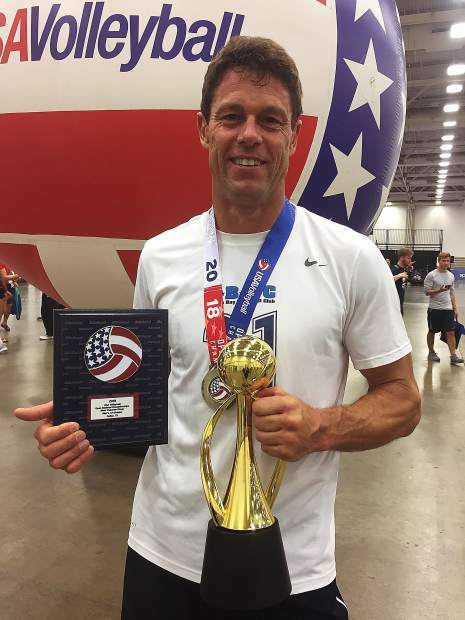 The Balboa Bay Volleyball Club’s 45 & over men’s volleyball team won the gold medal at the USAV Open National Championships in Dallas, Texas. Balboa Bay defeated the Adversity Volleyball Club of Chicago to capture this year’s title, the club’s fourth gold medal in the past five years in this age division. The team went undefeated in the tournament, winning all eight of its matches, and defeated three Brazilian teams, one Canadian team and the rest of the competitive international field during the three day open format tournament. Middle blocker Scott Cross, a Truckee native, was named the tournament MVP, improving from his all-tournament selection last year.